What is the island counter top wood and where from? The walnut is gorgeous but might be hard to find. 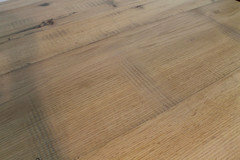 Have you considered Old Oak? It has a similar appeal and is rock hard for cutting surfaces. It can really take a beating. These are images from www.lakeandmountainhome.com. They can build a top for you as well. Maple is nice and rock hard too. Would you ever consider putting the stove in front of the window (maybe with a telescoping exhaust)? Im sorry to be commenting on this so long after your original post-however, I just came across it and had to put my "two cents" in. I am in the process of building a summer home in Falmouth, on Cape Cod, Massachusetts. I am adamant about the stove going directly underneath a triple pane window because I am trying to take advantage of Western sun (a scarce resource where we live...especially during our long dark winters). That said, the builder and architect are both thrilled with this idea even though they have warned me about the constant cleaning. Remember, everything is a give and take. My plan is to place an antique metal tile (about 36" x 36")that normally hangs on the wall as art, against the window while doing any really messy cooking. When you're done, you can wipe it clean and put back on the wall! I'd love to hear what you finally decided to do! Hi nazzgirl329, I decided to go ahead with it and use a downdraft exhaust that raises from behind the cooktop. It will all be installed in just a few weeks. I think your idea of a metal tile is a great idea. I might try something like that if I feel the cleaning becomes too much. Glad to hear your builder and architect liked the idea....I think it's great to do things in non-standard ways! Good luck with your kitchen. Are these glass subway tiles or ceramic...or something else? Ben, what color are the Subway tiles? Nice kitchen. Normally to preserve the 'work triangle' layout, you have the sink in the middle. Here, the stove and refrigerator are on the same side. Care to comment on the flow of the room? Size of Space - Could you tell me the lenght and width of the space on this floor (from front windows in living room to back windows in kitchen)? Thanks. Love the whole space! Hi, it is +/-14'-11" from the farthest edge of the fridge to the window wall x +/- 7'-9" from the edge of the island closest to us in the picture to the tiled wall behind the range. i love the push out french windows with handles, share please? Can you let me know what make or brand the stove is? 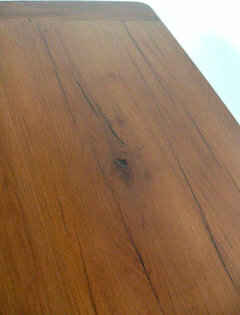 Walnut countertop - I love the weathered appearance of the island's walnut countertop. I'm curious to know the source as well as the height (I.e. thickness). I love a white kitchen especially with an island in the center and an unfinished wood counter top sets it off nicely. This is a great island that provides a nice contrast to the white cabinets. The natural look of the island gives the kitchen a really nice casual feeling. This is a great looking space. Can you tell me the dimensions of the kitchen? Also, what is the material/color variety of the main countertops? They are beautiful. Is the ceiling painted blue? If so can you please give me the name of the paint used? Thank you! liking the granite! - Please--what granite is on the counters? Please provide the distance between the table and the sink and stove. Thanks. Love the cozy kitchen! What paint color were the cabinets painted?? Where did the cabinets comes from? Thanks so much Ben. Beautiful work! hello! I absolutely love this layout. Can you tell me the dimensions of this kitchen? Do you know who makes the range hood and the size? What is the additional piece of stainless steel above the hood? Could you please tell me where the cabinets came from? Are they custom-made? Thank you! 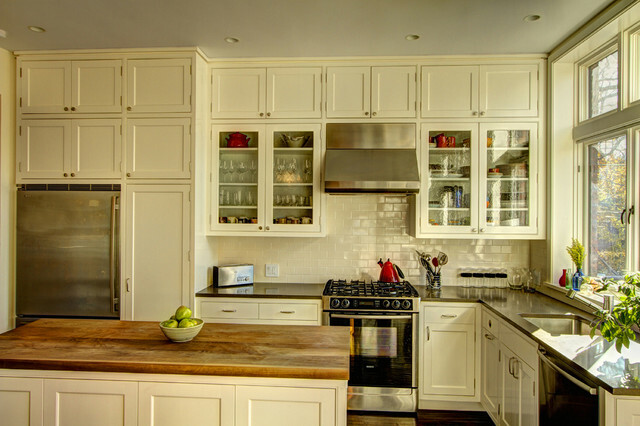 These cabinets were designed by us and custom-built by a local shop. They look just like Plain and Fancy inset cabinets with the hinge showing. could you please tell me what hardware is used on the cabinets? Thank you. Hi- sorry about the delay, I sometimes don't see the questions. The hardware is from colonial bronze, I believe. What kind of shelving do,you have in the 7' cabinet? Hi- If I understand the question correctly, you are referring to the 7' tall cabinet next to the refrigerator (it is actually about 6'-0" tall). That has pull out drawers for the bottom 2/3 and then a microwave shelf at the top. Please let me know if this is the info you were looking for. Thanks! Please provide the distance between the table and the sink and stove. The island is about 42" from the sink and stove counters. what is the dimention of the kitchen? Could you tell me about the countertops, color, where purchased? THX! The island is solid black walnut. the other counters are Caesarstone Lagos Blue. Are these countertops honed? - Amazing Kitchen!! The Caesarstone is not honed. And the island is wood. can you please tell me about the wonderful cabinets, are they custom? Thanks. They are custom. They were designed by us and built by Gala Architectural Woodworking in Brooklyn. Love the backsplash - color and style. - Is it an off white or is pure white? I need off white and I'm having a hard time finding the off white with the yellowish tinge I have in my cabinets. Everything seems a bit grayish/bone instead of almond. Please help! What hardware (brand and color) is used here? I believe, but can't say for sure, that the pulls and hinges came from Colonial Bronze and were satin chrome. Mayonnaise paint - Is there a yellow undertone in the mayonnaise colour? It is pretty warm. There is also a lot of sunlight and the camera exposure is effecting the color. I love the whole kitchen. Can you tell me about the fridge? It doesn't look as tall as alot of others. Can you tell me the overall dimensions of the far wall and also ceiling height and fridge height? Hi- Ceiling is +/- 9'-6"
Could you tell me the width the stove, and the lengths of both counter tops (on stove side of kitchen and on window side)? Thanks! Counter from end at dishwasher to tile wall is +/- 7'-9"
What is the stove made? If the counters are caesarstone, what color are they? Do you know what the cab/drawer knobs and pulls are? Grout color on backsplash? - Any chance you recall what grout color you used in the kitchen backsplash? 2. Measure your current kitchen work triangle (if you have one), and think about how much you'd need to add or take away for it to work more efficiently. Keep in mind that the lengths of the triangle don't have to be completely even. The shape of your triangle will differ depending on what kind of kitchen shape you have. Besides the recommended distance between the points of the work triangle, the most important thing to keep in mind is to make sure that the lines of the triangle aren't blocked by anything. Trash cans, islands and other kitchen necessities in the wrong place can end up making cooking harder.